Buy Mrs. Jumbo's look: Dress, $54.99 ; Shoes, $29.99 ; Necklace , $85 ; Bracelets, $6.80 ; Earrings, $9.99 ; Hat, $41.92. 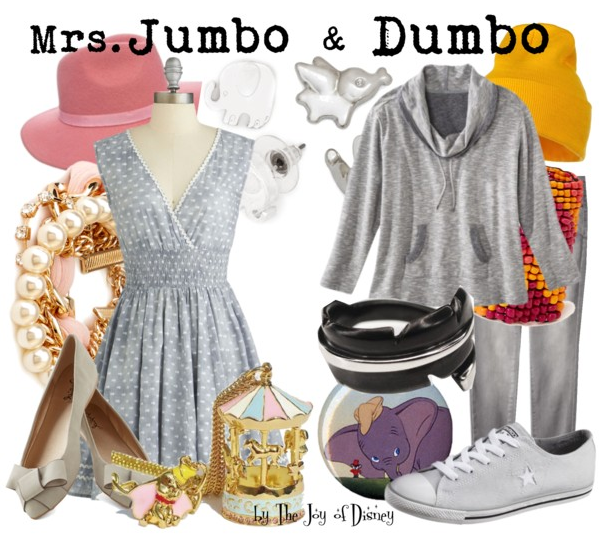 Buy Dumbo's look: Top, $29.99 ; Jeans, $27.99 ; Shoes, $34.99 ; Pin, $1.59 ; Feather ring, $47 ; Bracelet, $6.80 ; Earrings, $9.99 ; Beanie , $5.49. Mother and daughter outfits inspired by Mrs. Jumbo and Dumbo!